MANILA, Philippines - Kerima Polotan Tuvera, former editor in chief of Focus Philippines magazine and the Evening Post newspaper, died Friday night after a lingering illness. She was 85. 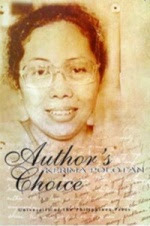 Polotan won four first prizes at the Palanca awards, and also garnered prizes in the Philippines Free Press short story contest as well as the Stonehill award for the novel in 1961. He went to where Miss Mijares sat, a tall, big man, walking with an economy of movement, graceful and light, a man who knew his body and used it well. He sat in the low chair worn decrepit by countless other interviewers and laid all ten fingerprints carefully on the edge of her desk. She pushed a sheet towards him, rolling a pencil along with it. While he read the question and wrote down his answers, she glanced at her watch and saw that it was ten. "I shall be coming back quickly," she said, speaking distinctly in the dialect (you were never sure about these people on their first visit, if they could speak English, or even write at all, the poor were always proud and to use the dialect with them was an act of charity), "you will wait for me." (UPDATED): This was a sad weekend for all writers who grew up w/ Tuvera and Tiempo's stories, or were mentored by these two grand dames of Philippine literature. MANILA, Philippines -- National Artist for Literature passed away Sunday. She was 92.